We find that stress is a very common enquiry among customers who visit our store. I think it’s becoming an increasing problem by virtue of the world we live in. Stress can manifest itself in many different ways and can be triggered by a variety of external events and internal emotional responses. I think more and more people are looking for natural ways to cope with stress as opposed to conventional medical treatments. An independent health store such as ours is a fantastic resource for help, advice and natural products. Before recommending any products, we always talk to our customers to find out key information such as how long they have been experiencing stress, how it manifests itself, what stressors there are in their life, whether they are taking any medication and whether they have had any other treatment. There is a wide range of natural products that can help with stress, from vitamins and minerals to herbal supplements. A.Vogel have some good products such as Stress Relief Daytime, which contains valerian and hops – both of which have a calming effect on the central nervous system. Their Passiflora Complex is also a good calming herbal tincture if appropriate. Viridian’s L-Theanine and Lemon Balm is another supplement we would recommend, as is Pukka’s Ashwagandha which has soothing, nourishing and rejuvenating qualities for the body and mind, directly reducing cortisol and anxiety and restoring neurological networks. In terms of homeopathic remedies there is Helios Stress Relief, which is good for mild stress and anxiety. Adaptogenic herbs like Astragalus, Rhodiola and Red Ginseng are particularly good for people who are constantly on the go and need some support because they help to build the body’s endurance against stress. In terms of vitamins and minerals, the B vitamins play a crucial role in regulating adrenal function however B5 is the main nutrient for nourishing the adrenal glands and combating the depleting effects of stress such as fatigue. Interestingly vitamin B5 can help to avert panic attacks. It can be taken when a person is feeling very anxious or feeling like a panic attack is coming on as it stops the adrenals from producing too much of the stress hormone cortisol. Magnesium and calcium are also very supportive to the nervous system. Another supplement to consider is omega-3 as this helps with endocrine and hormonal stability as well as brain function and mood stability. In addition to recommending supplements, we would of course ask about the person’s diet to see if there are any obvious contributing factors such as blood sugar instability or lack of protein in which case we would advise appropriately. We may suggest that they include nourishing, balancing or calming foods as well as easy-to-add ingredients to smoothies and breakfasts to set them up for the day, such as hemp powder, maca powder or banana powder. We might also recommend that the person tries some form of relaxation such as yoga, meditation or mindfulness – activities that incorporate an element of stillness. These can really help people to switch off. Another thing to consider is whether the person is getting enough exercise or perhaps doing too much exercise – it’s about getting the right balance. Also, are they getting enough sleep and rest? If not, then we may recommend specific supplements aimed at promoting sleep. If we feel that someone might need a bit more support – perhaps they may be suffering with depression as a result of their stress and anxiety – then we would suggest a reputable practitioner who could help, or we may refer the person back to their doctor. We always offer a holistic and personal approach and are happy to help and advise. 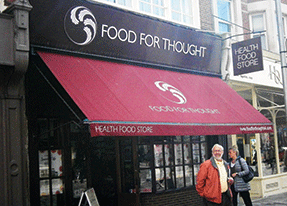 Food for Thought is part of a well-established chain of health food stores which have been trading for over 25 years. The stores, which are based in Kingston-Upon-Thames and Guildford, stock a wide range of organic health foods, supplements, herbal remedies, natural skincare products and cosmetics, as well as chilled and frozen foods. Food for Thought prides itself on being an ethical and carbon neutral retailer and seeks to work with suppliers and partners who support these values.